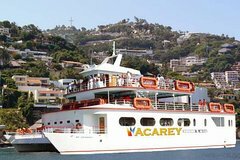 Experience all the beauty of Acapulco’s bay on a tropical cruise and relax to live music while you enjoy delicious cocktails. Be amazed by the spectacular scenery of sunsets and moonlight over La Roqueta Island and Acapulco on this 2.5-hour yacht cruise. Set sail on the Acarey for a picturesque cruise along the coast. Take in Acapulco’s spectacular scenery, sip a cocktail, and listen to the rhythms of live tropical music as you skim across the waves—the ship sails in time to catch the sunset or takes you out for a moonlit ride under the stars. Head down to the waterfront and meet your vessel at the Acapulco Principal Dock—the Acarey is a luxurious catamaran with spacious decks and shaded lounges. Grab a drink at the open bar and sit back to enjoy the view—La Roqueta Island, the expansive Pacific, and the beaches and coves of the shoreline are a picture-perfect postcard of Acapulco. For the afternoon cruise, make sure you’re on deck to catch the deepening hues and fiery glow of the Mexican sunset sinking down behind the ocean. With a margarita in hand, it’s a great way to close the day. For the night cruise, step aboard the yacht when the stars are already twinkling overhead for an unforgettable moonlit ride on the water. The sun may be down but the music is up for an evening spent dancing on deck under Acapulco’s sparkling night sky.